So I’ll be honest: I’ve never been to the West Virginia State Penitentiary in Moundsville, WV, in spite of having moved to West Virginia more than a year ago. I’ve seen it on TV shows, heard about it from members of our group who have been there several times, but never actually seen it for myself. 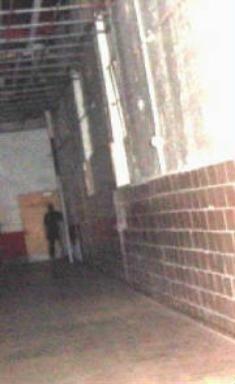 That will change in April, when I too will have the opportunity to meet the infamous shadow man of Moundsville (see one of the most talked about photos, taken by Polly Gear of Mountaineer Ghosts Paranormal Investigators, below). The prison was open from 1876 to 1995 and was known as one of the most violent and awful prisons in the country. No one knows how many people died there. From 1899 to 1959, 94 men were executed, 85 by hanging and 9 by the electric chair (which is still in the prison, BTW). There is no record of all the other deaths by suicide, murder, illness, and possibly even by mistreatment in the form of cruel punishments, but there is no doubt that a staggering number of souls found this prison their last stop. The conditions were atrocious, causing the spread of disease due to lack of sanitation and overcrowding, and there were two major riots (and really, who could blame them?). Eventually the tiny cells were ruled a cruel and unusual punishment and the prison closed its doors in 1995. With all the death, despair, fear, and torment that must have gone on within the prison’s stone walls, is it any wonder that it has the reputation as one of the most haunted prisons, if not one of the most haunted places, in the world? Reported phenomena (and the reports go back to the 1930s) include spectral inmates, the aforementioned shadow man, noises, voices, cold spots, and the occasional ghostly attack on the living. Not a place for the faint-hearted, but a great place for an investigator in search of real evidence. One of the rumors about the Pen is that it is built on Native American burial grounds, which allegedly cursed it from its inception and adds to the activity at the site. This is actually sort of true. Moundsville is named for the Grave Creek Mound, which was built by the Adena culture sometime between 250 and 150 BC. The mound is one of the largest conical type burial mounds in the United States. So if you subscribe to the theory that disturbing burial grounds, and particularly Native American burial grounds, leads to bad things, Moundsville might be the place to go to test that theory. Not only do you have the Adena mound to contend with, but there was also a cemetery at the prison itself containing the remains of many former occupants whose families wanted nothing to do with them. One of these unfortunate souls was Bud Peterson, the last man hanged at the prison. So to recap, you have a prison built very near a Native American burial mound. That prison was a hive of unspeakable evil, fear, and brutality for over 100 years, and some of the perpetrators (or victims) of that evil still remain buried within its grounds. If ever there was a place that should be haunted, the West Virginia State Pen is it. I will be heading to the Pen in April to finally check it out for myself and to maybe get my own photo of the much-debated shadow man. If you’d like to join me…you can! We will be conducting an investigation of the Pen on April 20, 2012 and would be delighted to include you (as long as you’re over 18). Please email guestinv@hauntedretreats.com for cost and information. You can also hook up with us on Facebook at https://www.facebook.com/HauntedRetreats. Believe me, this is not something you want to miss. If you’d like to hear some of the EVPs caught at the Pen by our group, go to http://www.blackravenparanormal.com/audio.html and click on the links for the WV Penitentiary. Great article Audrey!! And so true, this place ranks as one of my tops locations to investigate!! It is active and has a feel and a presence that few locations can match.